The writing and the remarkably genuine portrayals by the cast (Ann Dowd in particular) perfectly encapsulate every aspect of the narrative, from the mundane dialogues of a fried chicken restaurant to the shuddering panic of what follows. On the other side of the story is the fake Officer Daniels, a psychopathic manipulator who toys with power from the comfort of his living room. In his interactions with the Chickwich staff, the caller is quite clearly represented as a god-like intangible presence, but with the indifferent ruthlessness of a dictator. But for all its dread and misery, it’s also not afraid of the (very) occasional shot of dark humour, which show that Zobel still has a good grasp of the tone. Although Compliance is intimately shot and has a marvellous soundtrack, it is inherently driven by story rather than cinematography. I wouldn’t particularly recommend reading up on the finer details of the true events before seeing it, as uncertainty makes the build-up all the more engrossing. The stakes are raised bit by bit as the caller’s requests shift from awkward to sinister. The film culminates in a scene of sheer writhing horror which doesn’t really require an analysis. It would be nice to be able to say that Compliance was more or less an unadulterated account of the true events it is based on, and at face value it is, but in fact the final escalation is carefully sidestepped (although it is alluded to). It’s not surprising, however, that the writer’s better judgment had him go only as far as he did, as even earlier scenes had audiences cringing out of the cinema, and by that time the writers’ point had already been very forcefully made. Unless you are very desensitised, this film will affect you, but I would hold that the more people get offended the more important a piece of culture Compliance is. Something to note is that Compliance does not feel like it is meant to condemn the crimes or the perpetrators of that day. Rather, I feel that the aim of the film is more to raise the themes of authority and impersonality, even if its tidal wave of suspense leaves its audience too tormented to think about it at the time. Few films more powerfully portray the disconnect between power and responsibility, and the paranoia and cruelty that ensues. On a more fundamental level, Compliance asks us whether the people who do terrible deeds, or the ones who shape them, are really the villains. To sum up, the 4 star reviews that have been spunked all over the poster are not a good reason to be either perturbed or encouraged by this film. The point of it is to be one of the most unique and unsettling cinema experiences you will have for a long time. 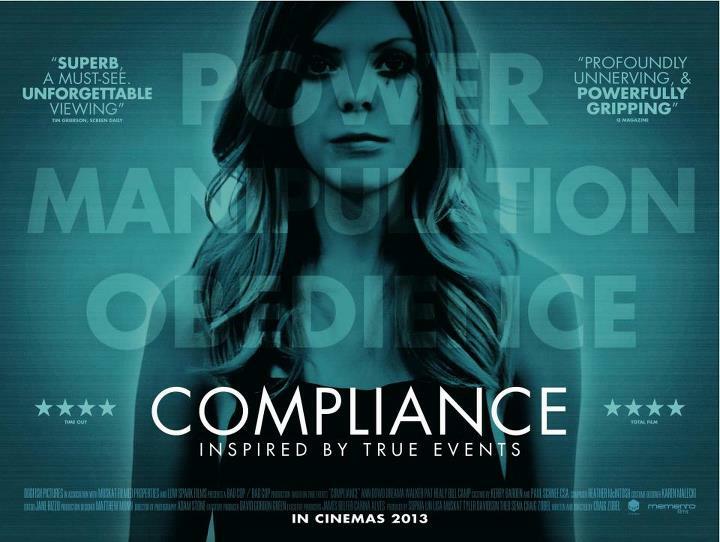 Compliance’s run in theatres is pretty much done as far as I know, but if you get the chance, watch it. Remember, nothing is exaggerated; apart from the flagrant black stereotype. Also if you want to learn more about the real life prank calls that happened, I recommend Wikipedia, the other faceless authority figure in your life. I think the idiom 'evil exists because good men stand by and do nothing' is encapsulated in this film. I agree its a must see.